That's one way to find your inner light! Maybe I have been insensitive. My son took one look and said: "Oh my god, is he OK?" Why didn't I have compassion for the frog?! He looks fine to me! Those lights are cold. Or not very hot. If he wasn't OK don't you think he'd look a bit more unconfortable? 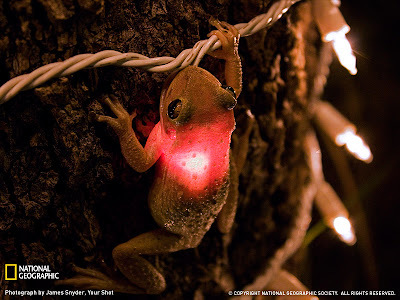 What is it like...to be a frog with a christmas light in your stomach?